Gluten-Free Living > Tips > If I’m gluten free, should my pets be, too? If I’m gluten free, should my pets be, too? Many people with celiac disease go to great lengths to remove traces of gluten from their home, without realizing pet food may be an irritant. Dogs are in close contact with us in bed, in the kitchen and in the car. 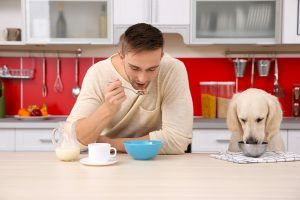 If you feed your pet in the kitchen, your dog licks or kisses you or you are sensitive to airborne gluten, dog food with gluten could pose a problem. Learn more here.